In Coding Projects, I have published a link to the updated version 0.6.2 of the GSB Script. Standalone versions will run without installation on Mac OS (Intel/PPC) and Windows. This update adds a new method of building up form arrangements: Simply start the dialog and answer the questions regarding what you want where in the form. As soon as you have the arrangement, it can easily be saved as a script file for later editing. Any feedback on this is much appreciated! This entry was posted in Uncategorized on November 20, 2008 by fgrote. 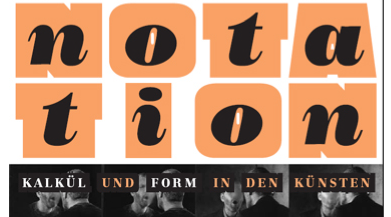 September 20 – November 16 at the Akademie der Künste, Berlin; February 14 – July 29 at the ZKM, Karlsruhe. Can you really exhibit notation? Is not the “exhibitionist” notion one of creating a work, a piece, an artefact, something for others to look at that is complete as an example of art? If so, then notation is limited to providing a process to create art, but never to be art. Interestingly enough, artists of many times have felt the need to incorporate their creative process into the final pieces. This is one of the main aspects I see in the current exhibition at the AdK. However, this poses a new question: If notation is indeed not limited to providing a process without ever being art itself, then how do we separate notation and final piece? Do we have to? Apparently the answer is yes, otherwise nobody would come up with an exhibition about notation. So do we see notation in art not as art but as something outside of art entering into the realm of art (but retaining its distinctive difference)? Although this exhibition certainly did not give me the definition of what notation is, it did help reformulating those questions. This entry was posted in Culture & Economy on November 10, 2008 by fgrote.